If the MP’s speeches don’t put you to sleep, at least you should be able to understand what they are saying. 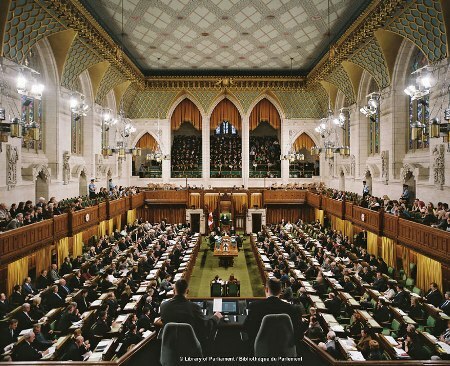 Using state-of-the-art audible simulations, a design team of acousticians, architects and sound system designers is working to ensure that speech within the House of Commons chamber of the Parliament of Canada now in design will be intelligible in either French or English. 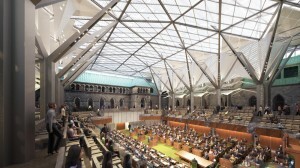 The new chamber for the House of Commons is being built in a glass-topped atrium in the courtyard of the West Block building on Parliament Hill in Ottawa. 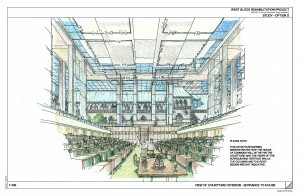 The chamber will be the temporary home of the House of Commons, while their traditional location in the Center Block building is being renovated and restored. 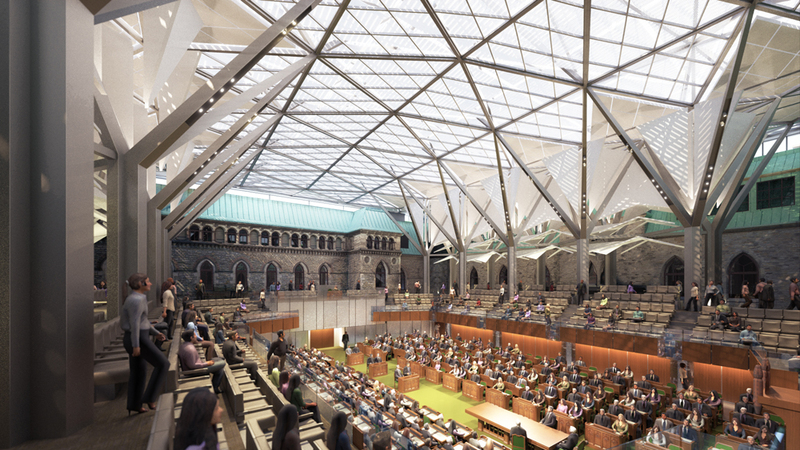 The skylit atrium in the West Block will be about six times the volume of the existing room, resulting in significant challenges for ensuring speech will be intelligibility. The existing House chamber is 21 meters (70 feet) long, 16 meters (53 feet) wide, and has seats for the current 308 Members of Parliament (to increase to 338 in 2015) and 580 people in the upper gallery that runs around the second level of the room. Most surfaces are wood, although the floor is carpeted, and there is an adjustable curtain at the rear of the MP seating area on both sides of the room. The ceiling is a painted stretched linen canvas over the ceiling 14.7 meters (48.5 feet) above the commons floor, resulting in a room volume of approximately 5000 cubic meters. 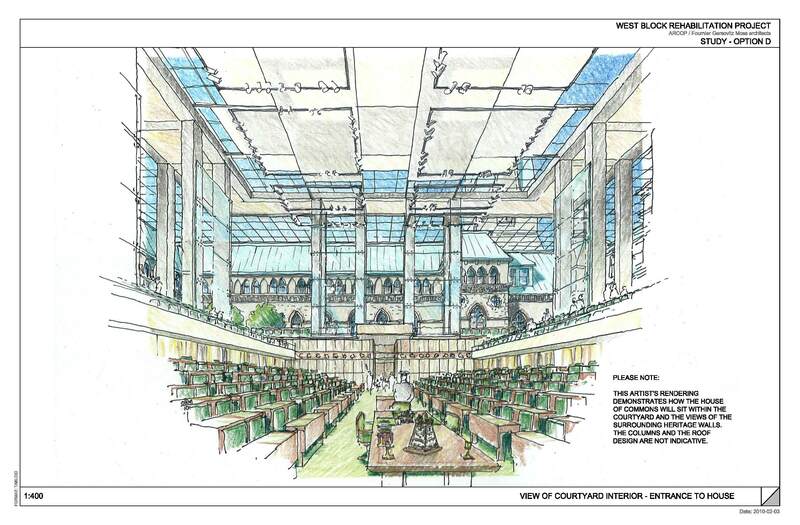 The new House chamber is being infilled into an existing courtyard that is 44 meters (145 feet) long, 39 meters (129 feet) wide, and 18 meters (59 feet) high. The meeting space itself will retain the same basic footprint as the existing room, including the upper gallery seating, but will be open to the sound reflective glass roof and stone and glass side walls of the courtyard. In the absence of any acoustic treatments, the high level of reverberant sound would make it very difficult to understand speech in the room. In order to help the Public Works and Government Services Canada (PWGSC) and the House of Commons understand the acoustic differences between the existing house chamber and the one under design, and to assure them that excellent speech intelligibility will be achieved in the new chamber, Acoustic Distinctions, the New York-based acoustic consultant, created a computer model of both the new and existing house chambers, and performed acoustic tests in the existing chamber. AD also made comparisons of the two room using sophisticated data analysis and tables of data an produced graphs maps of speech intelligibility in each space. The dark areas of the image show the location of sound absorptive materials, including triangularly-shaped wedges integrated into the structure which supports the roof. 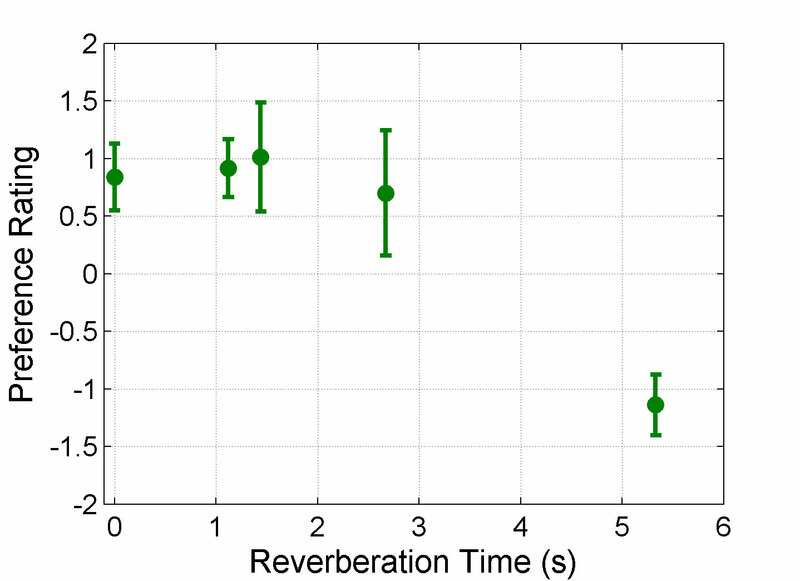 Using a standardized measure of intelligibility, AD estimated a speech quality of 65% using the Speech Transmission Index (STI), a standardized measure of speech intelligibility, where a minimum of 75% was needed to ensure excellent intelligibility. 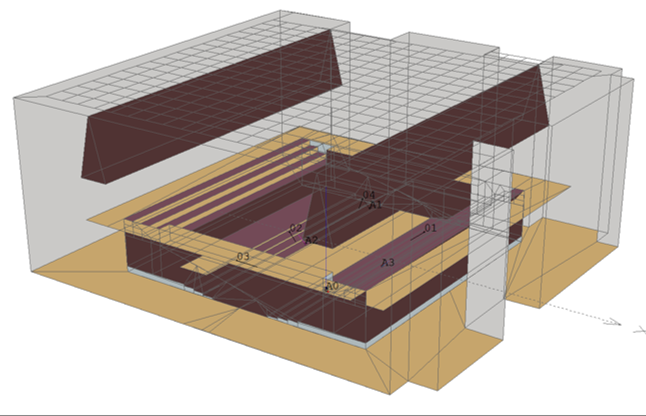 While these numerical and graphical tools were useful in understanding acoustic conditions of the new room, in order to make it easier for the client and design team to appreciate the acoustic recommendations made by the consultant, Acoustic Distinctions also produced computer simulations of speech within the new room, enabling the team to hear the way the new room will sound when complete. 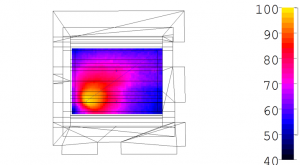 This approach, known as audible simulation or auralization, has been used to analyze a variety of room design options, and as the design progresses, new analysis and simulations are produced. This first audible simulation is made using the room model shown above. The talker is an MP standing near the center of the bright yellow area in the STI map above. 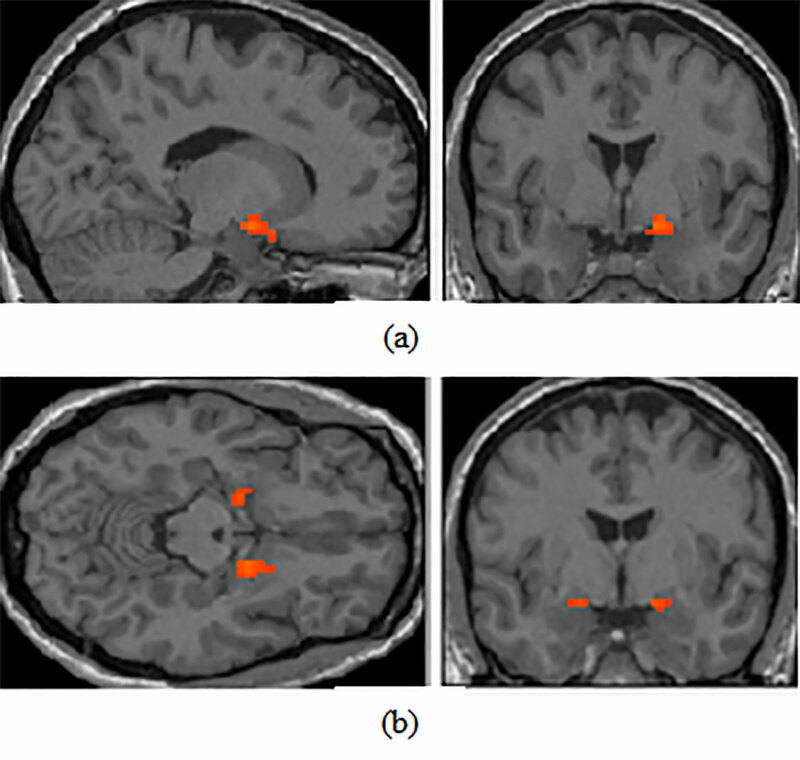 The listener is an MP seated in the opposite corner of the room, where the dark blue to black color confirms the STI value of just less than 0.70, corresponding to “good” intelligibility. 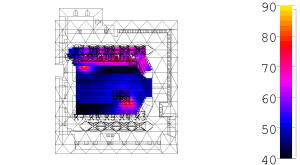 While these examples clearly show the benefit of a speech reinforcement system in the Chamber, the design and client team were not satisifed with the extent of sound absorptive materials in the ceiling of the Chamber that were required to achieve the results of excellent intelligibility. An additional goal was expressed to reduce the total amount of sound absorptive materials in the room, to make the structure and skylight more visible and prominent. Acoustic Distinctions therefore made changes to the model, strategically removing sound absorptive materials from specific ceiling locations, and reconfiguring the absorptive materials within the upper reaches of the structure supporting the roof. 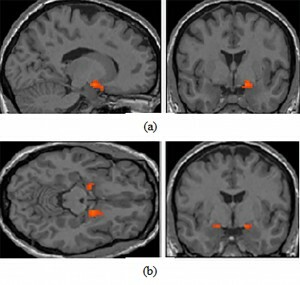 Computer models were again developed, and the resulting images showed that with careful design, excellent intelligibility would be achieved with reduced absorption.